It’s a little while now since Master C and I met Oliver and Patch in their first adventure. Back in that book Oliver had just moved to a big city and was lonely until he met Patch. They came together and started having some lovely adventures together whilst they looked for Patch’s real owner. 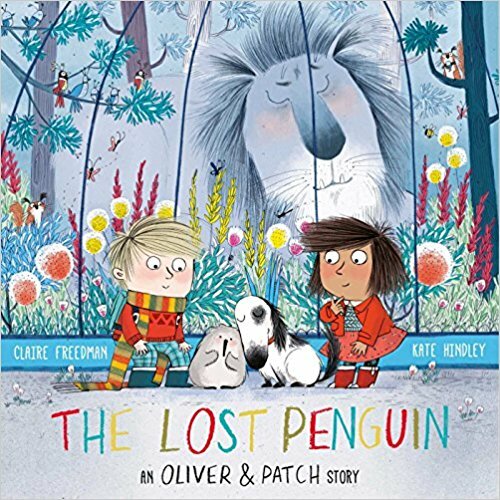 In The Lost Penguin, Oliver and Patch (and Ruby, Patch’s real owner) are back, but this time they’re visiting the zoo together. They growl at the tigers, smile at the meerkats and laugh at the funny penguins. But one little penguin catches their eye. Peep is new to the zoo. He’s lonely and misses his old home. When Peep goes missing the three friends search the city for him. It looks like there is going to be a happy ending when Peep is found, but whilst Oliver and Ruby are busy disagreeing about where he should spend the night, Patch and Peep disappear again. Together this time. The Lost Penguin is a beautiful tale about how friendship and how home is where your best friends are. Not only is there a wonderful moral message in the story, but it is also accompanied by gorgeously cute illustrations, by the incredibly talented Kate Hindley, that really bring the story to life. There’s no doubt that The Lost Penguin is a wonderful addition to Master C’s picture book collection. Especially since he’s been covering animals that live in cold places at school recently. He’s been talking loads about penguins, polar bears, arctic hares and arctic foxes, so it’s also a perfect book for him to share with his school friends. The Lost Penguin is published in paperback on 22nd February 2018 by Simon & Schuster. £6.99 ISBN 978-1-4711-1734-3 It is available to buy online here. Disclaimer: We were sent a copy of The Lost Penguin for the purposes of this review. All opinions remain my own. This post contains affiliate links.